List of 2 news stories. 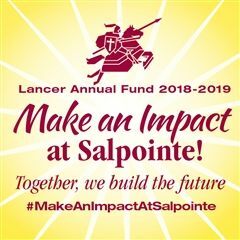 This $9.5M campus renovation will forever change Salpointe Catholic and the lives of Lancers for generations to come. Salpointe Catholic High School hosted a groundbreaking ceremony on Thursday, January 10, 2019, to commemorate the launch of the Aspire Capital Campaign. The Aspire Capital Campaign is a $9.5 million project that will complete the comprehensive campus renovation that was started in 2011 and prepare Salpointe to retain its position as the premier secondary school in Tucson. The ceremony welcomed 150 distinguished guests to our campus. Dignitaries included Fr. Emanuel Franco-Gomez, Fr. Paul Henson, Michael Slania, Chair of the Salpointe Catholic Board of Directors, and Amy Huether, Chair of the Salpointe Catholic Education Foundation. Fr. Manu Franco-Gomez offered the blessing over the ground that will become the foundation for the new Center for the Arts. "For us, Carmelites, a building is as solid as its community, as beautiful and functional as the service we offer to others, and as meaningful as the prayers that take place in it. Carmelite buildings are made for community, service, and prayer." Read the full reflection here. The Aspire campaign will round out the holistic student experience by creating the Salpointe Center for the Arts, a 28,000 square foot learning center for Art, Band, Choir, Dance and Drama students. A theater lobby and art gallery will also be constructed in addition to building six new classrooms on campus. The Salpointe STEM patio, which was created as part of the Building Leaders and Legacy Campaign in 2011, will be expanded for an increased student learning experience. Additional improvements on campus include expanding the weight room and adding air conditioning in the gymnasium. Prior to the 2018-19 school year, the track, baseball and softball fields received new lighting as part of the renovation. Please click here to visit the Aspire page and learn more about this exciting project. © 2019 Salpointe Catholic High School. All rights reserved.